Posted by Duncan in PeopleTools, Strategy. In an earlier post titled Banishing PeopleSoft Myths I shared my perspective of the current state of the PeopleSoft product and marketplace. I thought it’d be an interesting exercise to try to look forwards and to define what I think the future might hold for the product line. Some of this might be a little off-target, some might be a mile off target and some I might have changed my mind on if you ask me next week, but hopefully it starts some discussions. An easy one first. There’s a strong push to move to The Cloud and that should be apparent to pretty much everyone. There are some compelling success stories for PeopleSoft in the Cloud, customers have gained huge performance increases and flexibility in infrastructure, as well as saving money. So far these success stories have been on AWS, and – to a lesser extent – on Azure, however Oracle wants a piece of that pie now. The Oracle Compute Cloud should be an option whenever there’s a discussion on Cloud hosting (and this discussion should be held before any hardware refresh or major upgrade/get current). Oracle is also making it easier for customers to move to The Cloud. The PeopleSoft Cloud Architecture is a set of functionality and tools that eases the transition, and it will be enhanced in future PeopleTools versions. Cedar’s current experience is that there is a lot of activity in the market. Through the coming years we shouldn’t expect a huge number of net-new clients buying PeopleSoft, however existing clients are very loyal to the product and will continue to take advantage of the new features that are added to the product. It’s easy to imagine that over the coming years there will be widescale adoption of Fluid and Cloud Architecture. It’s becoming easier for customers to outsource the care of their PeopleSoft systems to partners – or, in the future, maybe even Oracle themselves. The Cloud makes the infrastructure significantly cheaper, and the PeopleSoft Cloud Architecture will make the administration simpler too. The PeopleSoft application will simply be provided to the client as a service, with all the hardware, DBA services and patc hing performed by the partner for a flat monthly fee. PeopleSoft updates could also be rolled into this as Selective Adoption forms a key piece of the application maintenance model and lends itself very well to the Cloud hosting model. There have been other advances in PeopleTools too that make it easier to reduce customisations – thereby making it easier for organisations to host multiple customer environments. The new related content event mapping functionality enables you to replace (some) customised code, and I’m sure the PSAdmin.io guys mentioned a technique for adding fields to a page via config instead of customisation (but I can’t find a link for it). The closer you are to vanilla the easier it is keep your application updated with the latest security, product fixes and new features. Will Oracle provide “PeopleSoft as a Service”? Currently the answer – at least publicly – is ‘No’ however that might change over time. Oracle are moving their OnDemand offering over from physical hardware to Cloud infrastructure so they will host the servers and provide maintenance resources for clients. good intro to containers here. Somewhere between 50-60% of customers are on v9.2, which means they’re either using or preparing to use Selective Adoption. Once a customer starts on the Selective Adoption path, they’ll find that the Fluid UI is the interface that updates and fixes will be delivered on. This will drive Fluid adoption. This is good for Self Service users as they’d typically benefit the most from a Fluid roll-out. Although there is some pain involved in getting Fluid up and running all of the feedback that we’ve heard to date is that those who’ve made the jump are very happy with the results. Self Service users stand to gain the most as Fluid really makes PeopleSoft a lot more accessible to infrequent users. The role of the PeopleSoft SysAdmin is dramatically different than it was 5 years ago. The advent of PUM, Selective Adoption, DPKs, Puppet and SES, and the imminent adoption of the Cloud Delivery Architecture and Elasticsearch have all shifted the landscape significantly. Much of this is good news. For instance, Selective Adoption and DPKs have both made the SysAdmin’s life easier (once the toolset has been learnt). The future sounds like this trend will continue as Cloud Manager will allow one-click provisioning and refreshes of environments, and Elasticsearch promises to alleviate some of the SES headaches. This greater functionality does come at a cost for the SysAdmin, and that is that there is a wider breadth to the set of tools that they are required to master. The days where the SysAdmin just needed to do installs and tuning have passed. This increased automation brings the requirement for DevOps SysAdmins – i.e. SysAdmins who are able to cut some code. I felt I should end with a real ‘out there’ prediction. With Elasticsearch we can see that Oracle are open to including a new 3rd party product as part of the stack (previously it seemed like 3rd party tools were slowly being phased out) so what other new products or tools might be included? Elasticsearch is made by a company called Elastic, but they have other offerings in addition to their core Search product. 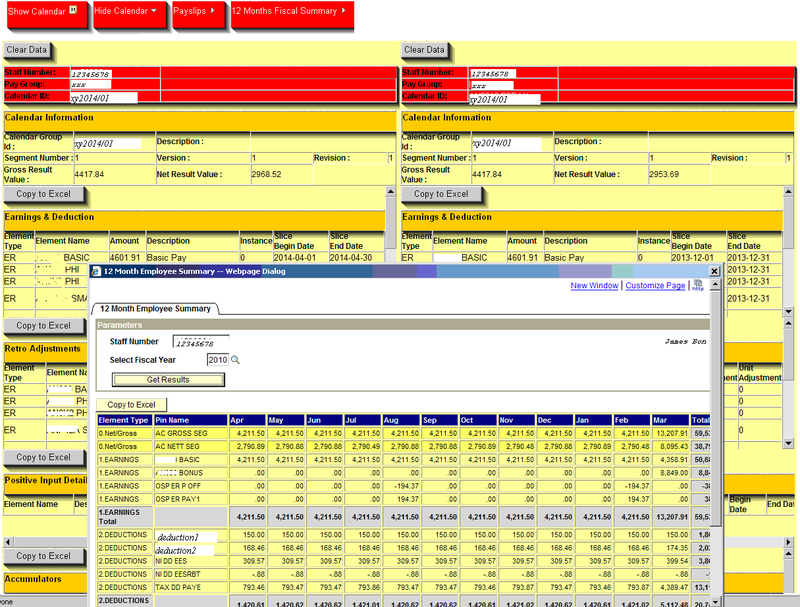 The one that looks the most appealing from a PeopleSoft point-of-view is LogStash. I’ve looked at it a number of times over the years but its lack of Windows support was always a barrier for me, however now it’s available on Windows. LogStash is a log file aggregation tool, it takes all of the entries in all of your log files spread across all of your servers and makes them available for searching in one central repository. It’s easy to see how that might be incredibly useful in a PeopleSoft context. There are alternative tools that perform a similar role – Splunk for example – however I think LogStash is the most obvious selection. UPDATE: The PSAdmin.io guys discussed Splunk and LogStash in their latest Podcast. So, there are 8 predictions for the coming years. Have I missed anything glaring? Have I got one of them wrong? Posted by Duncan in PeopleTools, TW. The ‘Year in Blogging’ reports have come through so I can see what posts and newsletter items garnered the most views. So, according to the summary, this blog was visited 130,000 times during the year, an average of ~350/day with the busiest day being just over double that at 749 visitors. About 50% of the traffic is from the US, 15% from India, and 5% from the UK and Canada. Amazingly, the most viewed post was one written prior to 2015, about PeopleSoft Entity Relationship Diagrams. The most popular post that was actually authored last year was The Future of PeopleSoft video with Marc Weintraub, followed by PeopleSoft and Taleo integration, the Faster Download of PeopleSoft Images and the profile of Graham Smith and how he works. The PSW newsletter seems to go from strength to strength. During 2015 the subscriber base rose from 919 to 1,104 which is an approx 20% increase. The ‘open rate’ sits around 40% for any one issue (against an industry average of 17%) with the US accounting for 55% of readers, the UK 15% and India 10%. Posted by Duncan in PeopleSoft, PeopleTools, Strategy, TW. If you’re ever in the situation where you’re wondering what your options are with PeopleTools versions, and which applications they can be used with, then we have just the document for you. – the combinations of the two, for instance, can you go to Tools 8.53 with a v8.9 application? do we believe that PeopleTools 8.55 will support v9.1 applications? – what this means for Fluid. For example, if you’re on v9.1 but upgrade to PeopleTools 8.54, what Fluid functionality do you receive? Posted by Duncan in PeopleTools, PeopleTools 8.53, PeopleTools 8.54, TW. Oracle have just announced two changes to what they require customers to be running on. If you’re on PeopleSoft v9.2 and using the Update Images to select the patches to apply then Oracle ‘strongly advises’ customers to be on the .10 patch of PeopleTools 8.53 or higher. FSCM Update Image 9.2.010 and higher, HCM Update Image 9.2.009 and higher, and ELM Update 9.2.006 and higher all need PeopleTools 8.53.10 for many of the updates and fixes to be applied. Failure to update your PeopleTools patch level to PeopleTools 8.53.10 or higher will result in the inability to take these updates and fixes. It may also inhibit you from applying critical maintenance in the future. Oracle also announced that they’re changing the support policy for Interaction Hub and PeopleTools. Basically, if you use Interaction Hub you must upgrade to a PeopleTools release no later than 24 months after that PeopleTools release becomes generally available. I suspect that this is going to impact quite a few of customers. This blog post has been kindly contributed by Richard Yip. Richard is a PeopleSoft HCM & Payroll Technical Consultant at Santander Bank here in the UK. He is a long-term PeopleSoft techie and a regular at the UKOUG conferences. Oracle have released a post detailing exactly which products are vulnerable to Heartbleed, which have fixes available and which aren’t vulnerable at all. Happily, PeopleSoft is on the ‘not vulnerable’ list. This doesn’t mean that you’re completely safe of course. You may well be using other components in your system that were impacted. At Succeed, for example, we use Amazon’s Elastic Load Balancer that was vulnerable but has now been patched. This week we have a guest-post from Richard Yip. Richard is a PeopleSoft HCM & Payroll Technical Consultant at Santander Bank here in the UK. He is a long-term PeopleSoft techie and a regular at the UKOUG conferences. I’m delighted to be able to give him a conduit through which to share some of his good work. This example shows a custom built payroll results calendar which allows the user to display multiple sets of payroll results information on a single page, without needing to navigate out of the page as is currently delivered. Additionally, it allows the display of related information such as payslip and 12 Months Fiscal Summary (pivoted summary results). Note: results have been “desensitized” . Main page after selecting an employee from a search page. Screen shot below show 3 different calendar group/calendar id clicked by the user using the results calendar above. 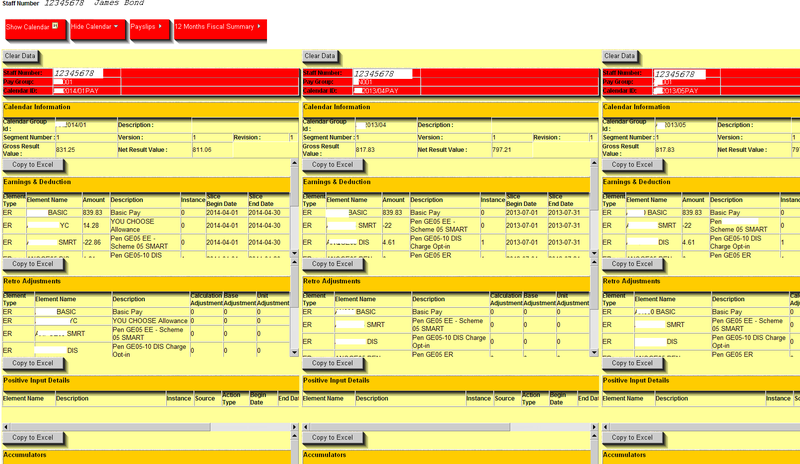 Using the window.showModalDialog function to display the 12 Months Fiscal Summary. See Get_Summary() in RY_GP_RSLT_CUSTOM_JS . Also see Get_Payslip(). Using a HTML editor facilitates prototype stage. In this example, it’s all about presentation as getting the data from the database via SQL is fairly easier. I have used the SQL XMLElement function to inject some html, albeit with a bit of trickery. Thanks for all your feedback on the roadshow / what’s next for PeopleSoft write-up. It’s wonderful that there’s such a large and active PeopleSoft community out there that’s so positive about the new functionality that Oracle is adding to the product. After I posted the article Marc Weintraub got in touch and has asked me to correct an inconsistency in one of the sections. I had included a paraphrased quote which gave the impression that net-new PeopleSoft opportunities are not important, and this was misleading. I’m happy to concede that about a week elapsed between his session and when I posted it here and my memory might not have been as fresh as if I’d live-blogged it. Also, there was another statement which I didn’t realise the signifcance of until letting things percolate down through on the train journey home, but Marc’s statement that PeopleSoft has a “95% retention rate, and the focus is on our existing customers.” is quite important. It’s great that Oracle are focusing on keeping existing customers happy – that’s what the ongoing licence fee is for, after all – and 95% is a good success rate and ongoing investment is designed to add value to existing customers. This last point is something that we can testify to as Succeed have implemented at least one greenfield PeopleSoft implementation every year for the last 5 years. Apologies if this has caused any confusion and I’m happy to set the record straight.